·Using Kaffe Fasset prints. I bought this charm pack without a plan, and I'm glad to have had it in my stash for this swap. ·Making wonky string squares. I have wanted to make a string block for a while now, and these prints are perfect for this type of block. 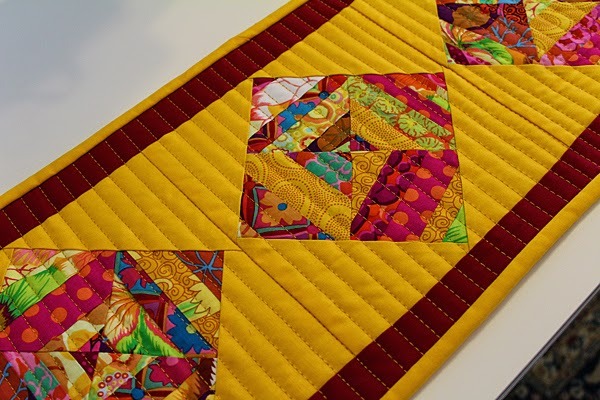 ·Quilting with a heavier, shiny thread. I used Superior Threads Magnifico #40 in Ingot (2068). It was a fun thread to use and adds a glimmer to the quilt without being over the top. 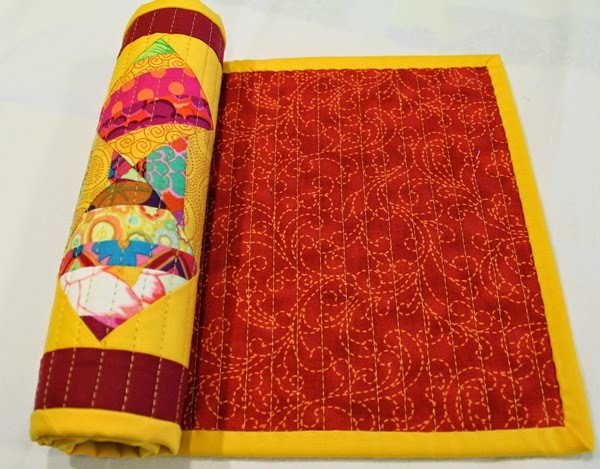 Other fabrics used were Kona Sunny and Kona Ruby. The backing is a Pat Sloan print from her Bobbins & Bits line. I quilted straight lines with my walking foot spaced approximately 1/2" apart. The finished size is 10"x24" and there is a hanging pocket attached to the back.